"Where billing & mailing your customers is a click"
Billing Statement, Invoice, Letter and Form Printing Services. Inserting Folding, Envelope Stuffing, Stamping Hand and Machine. 1st Class Presort, Bar-Code, Cass Certified, NCOA Bulk Mailing. Free Billing Statement, Invoice Design and Layout. Free Telephone Support 24 Hours a Day 7 Days a Week. Free Usage of Billing Pros Online Paper and Electronic Billing & Mailing Services Program. Larger Business Owners - you simply send us your PDF's, Microsoft Excel, XML, XLS Data Files and we turn them into professional Statements, Invoices, Collection Letters etc.. complete processing. 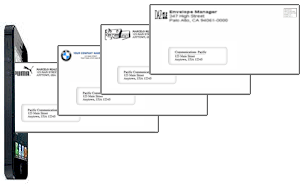 We handle all the data merging - envelope and form printing - inserting folding - envelope stuffing and mailing services. Everything is done in house at the Billing Pros facility - we do not use any outside vendors. As a licensed bulk mailer specializing in 1st Class Mailings and Standard Class Mailings we can offer the lowest possible postal rate per piece. Billing Pros services utilizes the latest technology in equipment guaranteeing professional finished products and the fastest turn around time in the business. We can merge your data into one of our professional design templates or we can design the look and layout of your own professional custom billing statement invoice or letter. Smaller Business Owners - may use our free online Billing Services Program at no charge to make easy work out of managing their customers accounts and billing information. Billing Pros automated online billing program incorporates a simple "click" to paper bill and a simple "click" to email bill button technology. Billing Pros is a family owned and operated business outsource services since 1998 has offered a quality, dependable, cost effective approach for business owners looking to outsource their customer billing and mailing. Complete Billing and Mailing Services For Business Owners.